Less than halfway through the first quarter of the NBA’s regular-season opener between the Cleveland Cavaliers and Boston Celtics, we all felt for Gordon Hayward. Well, most of us did — the ones with hearts, at least — after witnessing the All-Star forward, in his first game as a member of the Celtics, writhe in pain on the hardwood of Quicken Loans Arena after horrifically landing on his left leg. Hayward’s injury, which has been diagnosed as a dislocated ankle and fractured tibia, was reminiscent of a trio of past basketball accidents — from Shaun Livingston’s dislocated left kneecap and broken left leg in 2007 to Kevin Ware’s shinbone-protruding broken right leg in 2013 and Paul George’s tibia-fibula fracture in 2014. Hayward’s, however, might just be the worst. It brought the Cleveland players sitting on the team’s bench out of their seats. It led Celtics players to huddle in solidarity and pray for their teammate, while Cavs stars LeBron James and Isaiah Thomas (who recruited Hayward to Boston this offseason before being traded to Cleveland in a deal for Kyrie Irving) both went to the locker room to check on him as he received medical attention. And seemingly the entire basketball world took to Twitter to deliver support and well wishes for a speedy recovery. 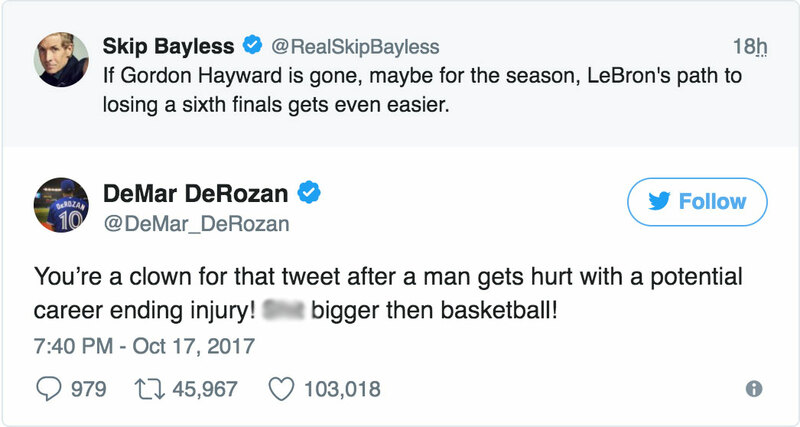 Yet some people took unfair advantage of the situation by using Hayward’s injury as an opportunity to criticize his offseason decision to leave the Utah Jazz to join the Celtics. This group of Twitter trolls parlayed 140 characters into diatribes that deemed his shattered ankle and leg an instance of karma. But what unfolded in Game 1 of the season had nothing to do with karma. It was merely a freak accident, to which the only real response is to hope that Hayward is able to return from the injury to even play basketball again. Among those to misjudge the moment on Twitter were Mia Khalifa, co-host of Complex’s new sports talk show Out of Bounds, and Skip Bayless, co-host of Fox Sports 1’s Undisputed. This was a sad moment for the entire culture of the NBA — no matter which team you root for or hot take you couldn’t hold back. Prayers up to Gordon Hayward.